Share the post "Blueprints for the Future"
I’m so hoping we don’t get a substantial frost for at least another week or ten days. The Fall flowers are so vivid and the grass is in deep hues of green at this time of year. Of course the deer are eating themselves crazy with people’s flower and vegetable gardens so to get themselves fattened up before the hard winter arrives. I’ve lately seen people’s hostas eaten almost to the ground. Somebody asked me why they just don’t stay with eating grass. I said, “Why would you eat grass when you have everyone supplying an outdoor salad bar?” I had several rows of beets that I was growing for some dear friends who love home grown beets, and before I could get them picked, the deer had eaten almost half of them. They seem to instinctively wait until a fruit or vegetable is nearing its peak when they arrive for their free feast. They are really nasty with tomatoes because they take one bite and move on to the next. It reminds me of what I recall hearing in my long ago past, “Take all you want, but eat all you take.” Oh well, in these times we’ll continue to be finding more wild animals adapting to city life. I had a good turnout at my public open house today which I was fearful wouldn’t have enough arriving due to another pleasant Fall day. That condo is about as spotlessly clean and maintenance free as one would ever find. Tomorrow’s open house is located at 935 – 8th St. SE and is long over-due to be sold. That’s all that home needs is someone with enough wherewithal and elbow grease to get this home back into shape and likely if they’d want to sell it in the near future, would make a hefty profit. As I’ve said many times over, there’s way too many people living in our country that neither have the knowhow to make improvements nor the desire. The lack of desire is what really stumps me—especially the young. Have many of us turned our incentive switches off? It goes right back to not blaming the young ones so much as blaming the parents. They overly nurture them and don’t give them an incentive to work and learn. When parents stop enabling children, they’re in a sort of sink or swim mode and nearly all learn to swim. 935 – 8th St. SE is a great example of a home having the three most important features: location, square footage, and quality of construction. Hopefully, more sooner than later it will get discovered by one of the rare industrious buyers looking for a home to build some quick equity. 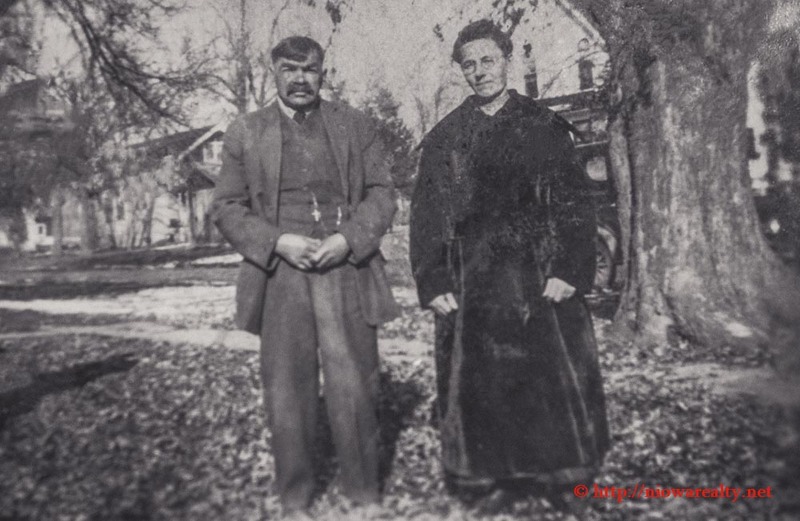 One of my dear old clients gave me a photo several weeks ago which was of some relatives who emigrated to the United States from Austria back in the 1870’s when they were newly weds. I would say they’re likely in their 50’s in the above photo. My client mentioned how they started with nearly nothing and worked likely those 30 years and made a good life for themselves by buying a large farm and raising their family. From what he said, nearly all their children, grandchildren, and great grandchildren worked hard and made something of themselves. So, what inspired those generations to do well within that family? Was the drive inherited, learned, or could it possibly be a sort of blueprint that was created by these two new arrivals to our free country in which they took advantage of all the tools of success available to them? I believe it was the blueprint for the future for their offspring to more easily copy their roads to success.